513 is one of a build of 35 double deck trams constructed between 1950-1952 by Charles Roberts & Co. of Wakefield (now Bombardier), to a design by Sheffield Transport, having comfortable upholstered seating for 62 passengers. It is carried on a 4-wheel Maley and Taunton hornless type 588 truck with rubber and leaf spring suspension. The car is powered by two Metrovick 101 DR3 65hp motors. Air brakes are fitted, acting on all wheels, and electric braking is available for emergency use. 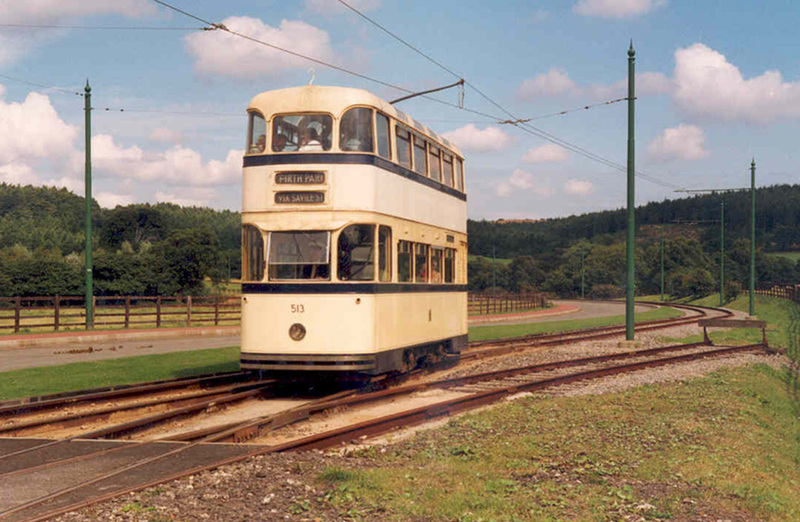 Representing the ultimate development of the traditional British 4-wheel tramcar, 513 worked for only 8 years, as Sheffield abandoned its first tramway system in 1960. On 8 October of that year 513 ran specially decorated in the final procession; so too did sister tram 510, now preserved by the National Tramway Museum at Crich. The wheel has now turned full circle, as Sheffield’s second tramway (South Yorkshire Supertram) was completed in 1995. 513 was purchased by Mr J Rothera of York, who stored it by the Middleton Railway in Leeds until September 1962, when it was moved to Cullingworth goods shed near Halifax. There it remained until 1973 when Mr Rothera presented it to the Castle Museum, York. No covered storage could be found at York, so after a period of outside storage it arrived at Beamish in 1976. During the 16 years of storage much damage was done. Many windows were broken and panels dented, the leather upholstery suffered and the mahogany mouldings stained by rain water. One of the controllers and some air pipework had been cut out and removed, the light fittings badly damaged and the air gauges destroyed. Restoration commenced in 1978 and the tram was fitted with a pair of Crompton-West CT/TJ controllers, entering service at Beamish in 1983. On 1 October 1984, 513 left for Blackpool where it operated on loan for 14 months, taking part with nine other preserved trams in the Blackpool Tramway Centenary celebrations in September 1985. After several more years’ service at Beamish, and a major mechanical overhaul, 513 returned to Blackpool in February 2001, this time for a long-term loan.